Isabelle Faust (no relation) appears at The Bach Variations. 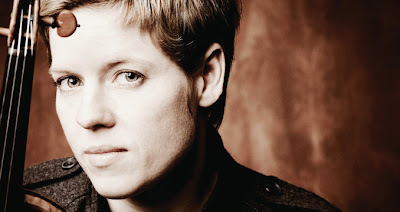 Isabelle Faust and friend. Photo © harmonia mundi. Aside from having the same surname, there is no apparent connection between German violinist Isabelle and Johann Georg Faust, the medieval philosopher who (according to legend) sold his soul to the Devil. However, given the sweet lyrical tone that Ms. Faust drew forth from her Stradivarius (the "Sleeping Beauty") at Saturday night's appearance with the New York Philharmonic, one might suspect that some unearthly forces were at work. This was the last of three concerts this week, the third of the ongoing Bach Variations Festival. They also mark Ms. Faust's first appearances with the orchestra, following an acclaimed international recital career and several award-winning recordings for harmonia mundi. The concert featured two of of the Bach concertos for solo violin, along with two Orchestral Suites and a rare Sinfonia (overture) from Cantata No. 42. Bernard Labadie, a French-Canadian period performance expert conducted. A high level of playing was present in the Fourth Orchestral Suite, which allowed the Philharmonic double reeds and trumpets to join the strings in exploring this familiar musical territory. This is one of Bach's most elaborate musical conceptions. Mr. Labadie demonstrated his thorough knowledge and enthusiasm for this familiar work, elevating briefly from the podium as he led the downbeats of the final movement. The brief Sinfonia, which led off the second half of the performance, left one yearning for the presence of a vocal ensemble to do the whole cantata. Bach was a master violinist, but these twoconcertos held no terrors for Ms. Faust. Working from the printed score, she played the first movement of the E Major Concerto in close concert with Mr. Labadie. She unleashed her first cadenzas at the end of that movement, paving the way for a reflective slow central movement that emphasized the vocal nature of Bach's writing. In the finale, her solo part capered nimbly above the composer's counterpoint, to enchanting effect. The A minor Concerto is, if anything more internal and reflective than its brother, with exceptional opportunity for the soloist to ruminate over Bach's figured bass. Again, Ms. Faust played with a dulcet tone, drawing the notes forth in a way hat emphasized her firm, singing lyric line. The nimble Allegro finale concluded with dazzling technique hinting at the great things to come from this artist's future visits to New York. The Third Orchestral Suite ended the evening. Although the trumpets' entry in the first movement jarred slightly, the ensemble went on to deliver a firm, sturdy performance, including the famous Air on a G String. Better yet was a performance of the slow section of the Gavotte, where five Philharmonic players proved the value of this orchestra even when reduced temporarily to a chamber ensemble.